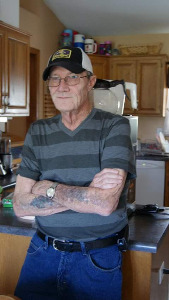 Ronald “Joe” Heather age 71, passed away peacefully in his home on September 16, 2015 in Gardner, KS. Joe was born on January 16, 1944 in Wooldridge, MO to his parents, Orville and Nellie (Lamm) Heather. He graduated from Boonville High School 1961 and married Cheri Mahns in Portage, Indiana on June 26, 1965. Joe was an Iron Worker at Local Union #10 Kansas City, MO. He retired after 41 years at the age of 59. He was a member of the Olathe Masonic Lodge #19. He is survived by his wife of 50 years Cheri Heather, his daughter Christina Bachman of Olathe, KS, his son Ronald D. Heather of Gardner, KS. He has 5 grandchildren and 2 great-grandchildren. A sister, Mary (David) Williams of Kentucky, and many nieces and nephews. He is preceded in death by his parents and two brothers David and Richard Heather. Add your memories to the guest book of Ronald Heather. Great guy, going to miss you at "B" dock ole buddy, sure the good Lord has a big un waiting on you at his special fishing hole! Anyone who ever knew Joe would say that he was a great guy. I can tell you that he was a great brother. We all love our families, but Joe took it to the next level. He took care of us all in any way that he could. Just weeks ago he was at my house fixing a door in my house that needed fixing. I didn't need to ask, he just saw that it needed attention and he took care of it. That's the way Joe was. He loved us all and he showed it in his own caring and loving way. When a member of the family leaves us, its never the same....and it certainly will be that way now that Joe has gone on to Glory. We all must hold on to the promises of Jesus in that we will be with him once again in Heaven when God calls us home. I miss Joe already and things just won't be the same....but I know he is happy where he is. I know there is no such thing as death. I know my sister will be alright, because this is all in the hands of God and God is good. Dad you were the most selfless , caring and loving person I know. The best father , grandfather and great-grandfather anyone could ask for . We were truly blessed to have you in our lives. A piece of my heart is gone and can never be replaced. I love you Daddy .